Tarazod Films & Media LLC: Audio down to one last scene for "Don Circles the Drain"
Audio down to one last scene for "Don Circles the Drain"
Executive Producer Rick Richards stopped by today to view the latest edit of Don Circles the Drain, which is so very, very close to being completed. The audio for the entire film is now done except for one last sequence--the Crowd Scene--in which our star Don (played by Odari Kimani) is unexpectedly greeted by his adoring fans. We recorded lots of yelling, screaming, and miscellaneous outpourings from the cast and slew of extras who showed up that day on August 24, 2013--nearly 2 years ago! 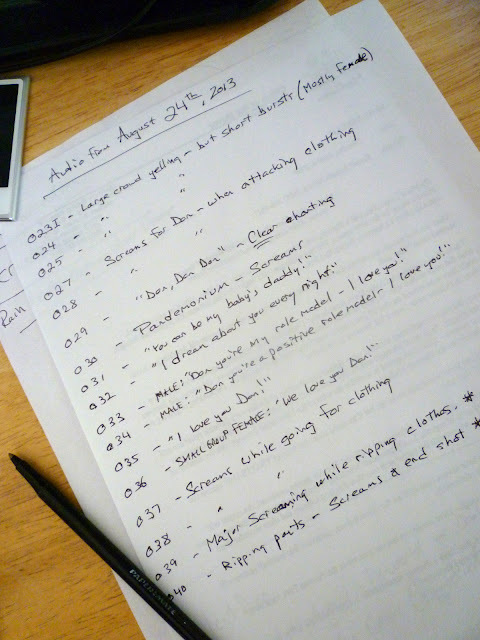 The audio log list for the Crowd Scene.